I held the orange packet in my hands and presented it to my friend, Seth, as though it were a plastic-wrapped jewel—rather than three ounces of dehydrated noodles. "From this," I said, "We shall create a feast fit for kings." He looked softly into my eyes. The sadness was unmistakable. "Taylor," he said, "This is a snack you eat when you're in college and drunk. I mean, no king would eat this. In Game of Thrones, they'd probably eat you instead." My eyes hardened, and I snatched the packet from him. "I shall prove you wrong!" And I then did, revealing the true versatility of ramen with a few crafty maneuvers I'll be sharing with you today. While the conventional way of cooking ramen is to boil it in water and then serve it as a soup, it can also be baked, seasoned, stir-fried, or casseroled into delicious creations. 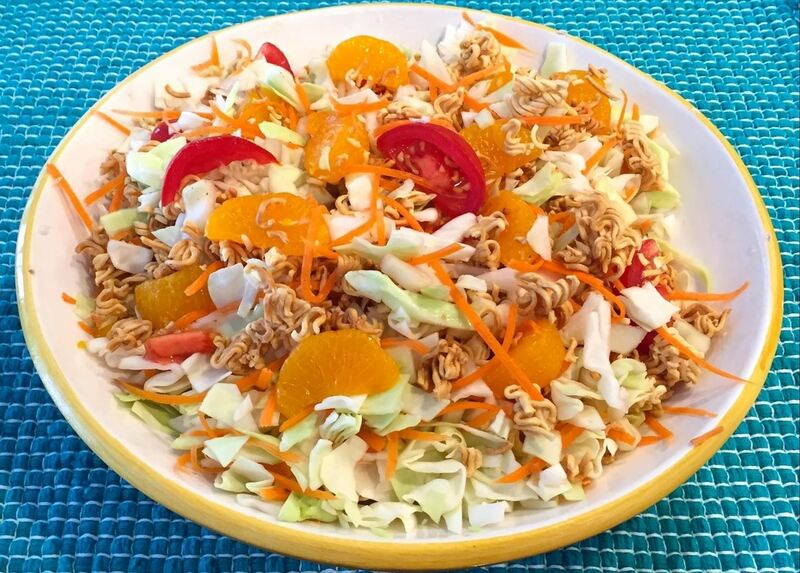 Since cabbage has a nice crunchy texture, the ramen won't overwhelm the greens in this salad. Steer clear of softer types of salad bases (such as butter lettuce), although you can get away with romaine hearts or iceberg as a replacement. To bake ramen, preheat your over to 475°F. Break the ramen into small chunks (about half an inch big). Spread onto a baking sheet, and drizzle with olive oil. Next, bake for approximately 10 minutes, or until golden brown. For the salad, toss the ingredients together for a crunchy and flavorful result! This is the perfect treat for movie night, or as an appetizer for your main ramen course! In a small bowl, combine the maple syrup and brown sugar. In a separate large bowl, combine the remaining ingredients. Add the brown sugar and maple syrup mix to the large bowl of ingredients and stir until the maple syrup evenly coats the mixture. Bake for 5 minutes at 475°F to lightly caramelize the mix. Aside from baking ramen, it can also become very versatile once boiled. 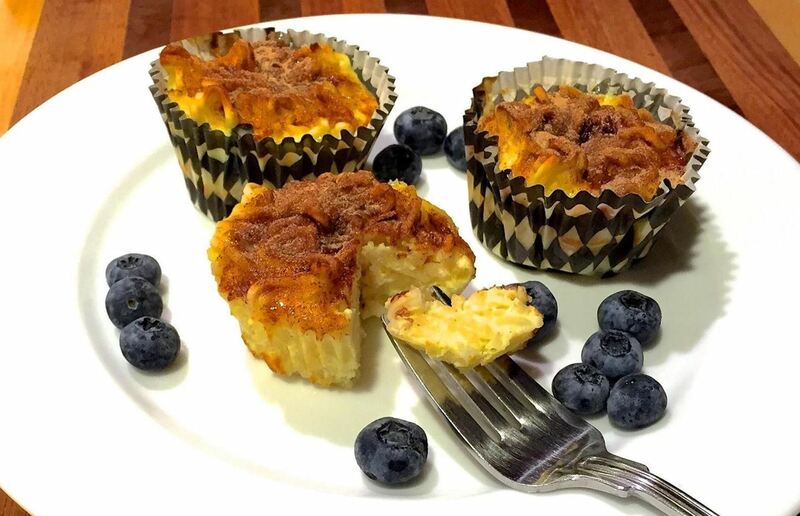 After boiling ramen, you can use it as a noodle for creating kugel, a traditional Jewish dessert. Essentially, you create an egg-based custard, and bake in the ramen noodles. This recipe from the Food Network is excellent: just use the ramen as your noodle substitute when following directions. 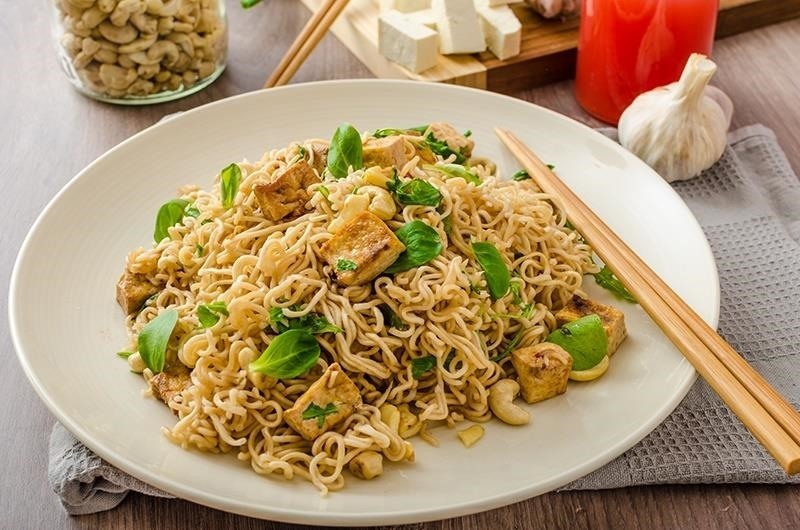 Another way to use cooked ramen noodles is as the base for an easy vegetarian stir-fry. Heat the oil and stir-fry sauce in a wok or large pan. Add the noodles, stirring until well-coated by the sauce. Add the veggies and stir until the vegetables are warmed through. You can also add in tofu as a protein supplement to create a well-rounded meal. Each of these ramen-based treats is delightful in its own right, although there is a lot to be said for serving them all together, as I did for Seth. 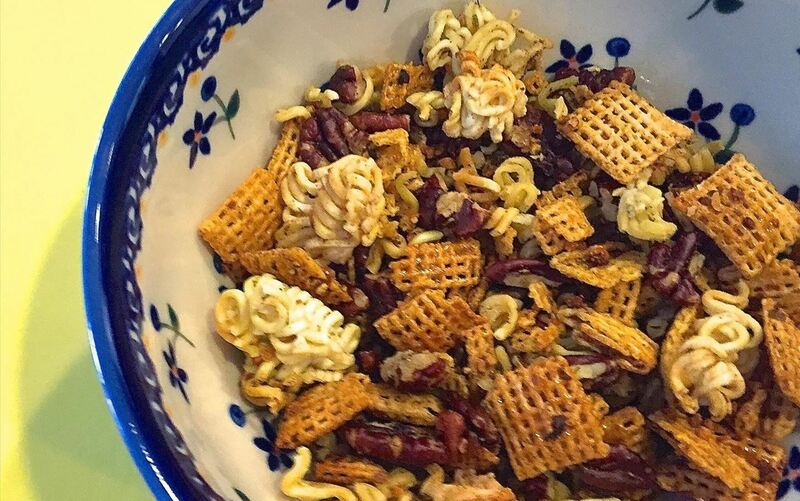 We began with the ramen snack mix as the gateway into our ramen redux. Next, we nibbled upon the ramen salad, followed by the easy veggie stir-fry (supplemented by tofu) as the main course. And of course, the kugel was our dessert. As delicious as the kugel was, its sweetness could not compare to that of Seth's concluding remarks. "Taylor," he said, "This was a feast fit not just for kings—but for gods." "The old and the new?" I asked. He nodded. "The old, and the new." HA! They've been doing this, and better, inside the walls for years!